1999 was a watershed year for people in my generation, as it no doubt was for other generations as well. On the eve of the new millennium, we were caught in a place between excitement and apprehension. The 21st century loomed large with promises of technological and sociological innovations, yet we were beset by decidedly 20th century baggage, like an adultery scandal in the White House or the nebulous threat of Y2K. This potent atmosphere naturally created its fair share of zeitgeist pop culture work, but no works had more of an impact on the public that year than The Wachowski Brothers’ THE MATRIX and David Fincher’s FIGHT CLUB. I was only in middle school at the time, but FIGHT CLUB in particular captivated my friends and I with the palpable substance behind its visceral style. As a kid already consumed by a runaway love for movies, FIGHT CLUB was one of the earliest instances in which I was acutely aware of a director’s distinct voice. As such, the films of director David Fincher were among the first that I sought out as a means to study film as an art form and a product of a singular creative entity. His easily identifiable aesthetic influenced me heavily during those early days, and despite having taken cues from a much larger world of film artists as I’ve grown, Fincher’s unique worldview still shapes my own in a fundamental way. Fincher was essentially the first mainstream feature director to emerge from the world of music videos. Ever the technological pioneer, Fincher innovated several ideas about the nascent music video format that are still in use today. This spirit of innovation and a positive shooting experience on the set of 2007’s ZODIAC eventually led to him becoming a key proponent of digital filmmaking before its widespread adoption. A student of Stanley Kubrick’s disciplined perfectionism and Ridley Scott’s imaginative world-building, Fincher established his own voice with a cold, clinical aesthetic that finds relevancy in our increasing dependency and complicated relationship with technology. Fincher was born in 1962, in Denver, Colorado. His father, Howard, worked as the bureau chief for LIFE Magazine and his mother, Claire Mae, worked in drug addition facilities as a mental health nurse. Fincher spent most of his formative years in northern California’s Marin County (a setting he’d explore in his features THE GAME (1997) and ZODIAC), as well as the small town of Ashland, Oregon. Inspired by George Ray Hill’s BUTCH CASSIDY AND THE SUNDANCE KID (1969), an 8 year-old Fincher started to make little movies of his own using his family’s 8mm film camera. 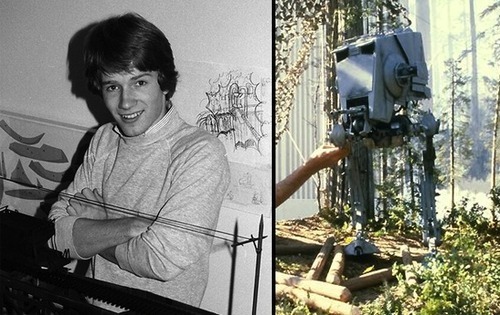 Having grown up in a time when film schools were well established, Fincher—rather interestingly—opted against them in favor of going directly into the workforce under Korty Films and Industrial Light and Magic (where we would work on 1983’s RETURN OF THE JEDI). It was Fincher’s time at ILM specifically that would shape his fundamental understanding of and appreciation for visual effects, and his incorporation of ILM’s techniques into his music videos no doubt led to his breakout as a director. At the age of 22, Fincher directed his very first professional work, an anti-smoking ad for the American Cancer Society called“SMOKING FETUS”. Anti-smoking ads are infamous for being shocking and transgressive as a means to literally scare people out of lighting up. “SMOKING FETUS” was the spot that undoubtedly started it all by featuring a fetus in utero, taking a long drag from a cigarette. The crude puppetry of the fetus is horrifying and nightmarish—an unholy image that delivers a brilliant whallop. Fincher has often been called a modern-day Kubrick because of his visual precision and notoriety for demanding obscene numbers of takes—a comparison made all the more salient when given that both men shared a thematic fascination with man’s relationship (and conflict with) technology. Fincher’s modeling of his aesthetic after Kubrick’s can be seen even in his earliest of works. Shot against a black background, the fetus floating in space resembles the Star Child of 2001: A SPACE ODYSSEY (1968). “SMOKING FETUS” brought Fincher to the attention of Propoganda Films, who subsequently signed him on in earnest, effectively launching his career. Due to the strength of “SMOKING FETUS”, 80’s rock superstar Rick Springfield enlisted Fincher to direct his 1984 concert film, THE BEAT OF THE LIVE DRUM. The responsibility also entailed the shooting of four pre-filmed music videos to incorporate into the live show. “DANCE THIS WORLD AWAY” features three vignettes: a man dancing amongst the ruins of a post-apocalyptic wasteland, a happy-go-lucky TV show for kids, and a ballroom filled with socialites oblivious to the nuclear missile launching from underneath the dance floor. The piece establishes several traits that Fincher would incorporate into his mature aesthetic like stylized, theatrical lighting, an inspired use of visual effects and elaborate production design. “CELEBRATE YOUTH” is presented in stark black and white, punctuated by bright pops of color like the red of Springfield’s bandana or the indigo of a child’s sneakers. This conceit further points to Fincher’s familiarity with special effects, as such a look requires the shooting of the original footage in color and isolating specific elements in post production. The look predates a similar conceit used by Frank Miller’s SIN CITY (both the 2005 film and the comic it was based upon), so it’s reasonable to assume that Fincher’s video very well could have served as an influence for Miller. “CELEBRATE YOUTH” also highlights Fincher’s inspired sense of camera movement, utilizing cranes and dollies to add energy and flair to the proceeds. “BOP TIL YOU DROP” tells Fincher’s first narrative story in the form of a slave revolt inside of a futuristic METROPOLIS-style dystopia. This is Fincher’s earliest instance of world-building, using elaborate creature and set design, confident camera movements and theatrical lighting (as well as lots of special visual effects) to tell an archetypal story of revolution. Rounding out Fincher’s quartet of Rick Springfield videos is “STATE OF THE HEART”, which compared to the others, is relatively sedate and low-key in its execution. While the piece takes place inside of a single room, Fincher still brings a sense of inspired production design in the form of a cool, metallic color palette. Indeed, “STATE OF THE HEART” is the first instance within Fincher’s filmography of the cool, steely color palette that would later become his signature. 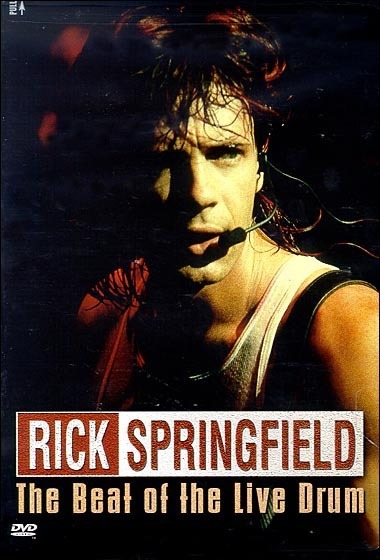 All of the aforementioned music videos, while capable of acting as standalone pieces, were produced for eventual incorporation into Rick Springfield’s larger concert film, THE BEAT OF THE LIVE DRUM. With his first feature-length work, Fincher more or less follows the established format of concert films—performance, audience cutaways, wide shots that give us the full scope of the theatrics, etc. He makes heavy use of a crane to achieve his shots, partly out of necessity since he can’t exactly be on-stage, yet it still shows a remarkable degree of confidence in moving the camera on Fincher’s part. And while it probably wasn’t Fincher’s idea or decision, THE BEAT OF THE LIVE DRUM contains a pretty blatant Kubrick nod in the form of a guitarist wearing Malcolm McDowell’s iconic outfit from A CLOCKWORK ORANGE (1971). The concert film format doesn’t allow much room for Fincher to exercise his personal artistic voice, but he does manage to add a few stylistic flourishes in the form of visual effects that were added in after the live filming. He adds a CGI blimp hovering over the stage, as well as fireballs that erupt from various places throughout the stadium (several audience cutaways appear blatantly staged to accommodate the inclusion of these effects). Despite being something of a time capsule for ridiculous 80’s hair rock, it’s a high quality romp through Springfield’s discography that briskly clips along its brief 70 minute running time without ever really sagging. Fincher’s involvement with THE BEAT OF THE LIVE DRUM wasn’t going to net him any opportunities to transition into features, but it did generate a significant amount of buzz for him in the music video and commercial world, where he’d spend the better part of a decade as one of the medium’s most sought-after directors. THE BEAT OF THE LIVE DRUM is currently available as a standard definition stream on Hulu.